A-Frame is a three.js framework with an entity-component-system (ECS) architecture. ECS architecture is a common and desirable pattern in 3D and game development that follows the composition over inheritance and hierarchy principle. Greater flexibility when defining objects by mixing and matching reusable parts. Eliminates the problems of long inheritance chains with complex interwoven functionality. Promotes clean design via decoupling, encapsulation, modularization, reusability. Most scalable way to build a VR application in terms of complexity. Proven architecture for 3D and VR development. Allows for extending new features (possibly sharing them as community components). On the 2D Web, we lay out elements that have fixed behavior in a hierarchy. 3D and VR is different; there are infinite types of possible objects that have unbounded behavior. ECS provides a manageable pattern to construct types of objects. A well-known game engine implementing ECS is Unity. Although there are pain points in cross-entity communication, we’ll see how A-Frame, the DOM, and declarative HTML really make ECS shine. Entities are container objects into which components can be attached. Entities are the base of all objects in the scene. Without components, entities neither do nor render anything, similar to empty <div>s. Components are reusable modules or data containers that can be attached to entities to provide appearance, behavior, and/or functionality. Components are like plug-and-play for objects. All logic is implemented through components, and we define different types of objects by mixing, matching, and configuring components. Like alchemy! Systems provide global scope, management, and services for classes of components. Systems are often optional, but we can use them to separate logic and data; systems handle the logic, components act as data containers. We can attach a material component that has properties such as “color” or “shininess” that affects the appearance of the car. We can attach an engine component that has properties such as “horsepower” or “weight” that affects the functionality of the car. We can attach a tire component that has properties such as “number of tires” or “steering angle” that affects the behavior of the car. To create a boat entity: remove the tire component. To create a motorcycle entity: change tire component’s number of tires to 2, configure the engine component to be smaller. To create an airplane entity: attach wing and jet components. Contrast this to traditional inheritance where if we want to extend an object, we would have to create a large class that tries to handle everything or an inheritance chain. Entities are represented by the <a-entity> element and prototype. Components are represented by HTML attributes on <a-entity>‘s. Underneath, components are objects containing a schema, lifecycle handlers, and methods. Components are registered via the AFRAME.registerComponent (name, definition) API. Systems are represented by <a-scene>‘s HTML attributes. System are similar to components in definition. Systems are registered via the AFRAME.registerSystem (name, definition) API. <a-entity geometry="primitive: sphere; radius: 1.5"
light="type: point; color: white; intensity: 2"
material="color: white; shader: flat; src: glow.jpg"
From there, we could attach more components to add additional appearance, behavior, or functionality (e.g., physics). Or we could update the component values to configure the entity (either declaratively or through .setAttribute). A common type of entity to compose from multiple components are the player’s hands in VR. The player’s hands can have many components: appearance, gestures, behaviors, interactivity with other objects. Referencing Other Entities with Query Selectors: The DOM provides a powerful query selector system which lets us query the scene graph and select an entity or entities that match a condition. We can get references to entities by IDs, classes, or data attributes. Because A-Frame is based on HTML, we can use query selectors out of the box. document.querySelector('#player'). Decoupled Cross-Entity Communication with Events: The DOM provides the ability to listen to and emit events. This provides a publish-subscribe communication system between entities. Components don’t have to know about each other, they can just emit an event (which could bubble up), and other components can listen to those events without calling each other. ball.emit('collided'). APIs for Lifecycle Management with DOM APIs: The DOM provides APIs to update HTML elements and the tree including .setAttribute, .removeAttribute, .createElement, and .removeChild. These can be used as is just like in normal web development. Entity-Filtering with Attribute Selectors: The DOM provides attribute selectors which allows us to query for an entity or entities that have or don’t have certain HTML attributes. 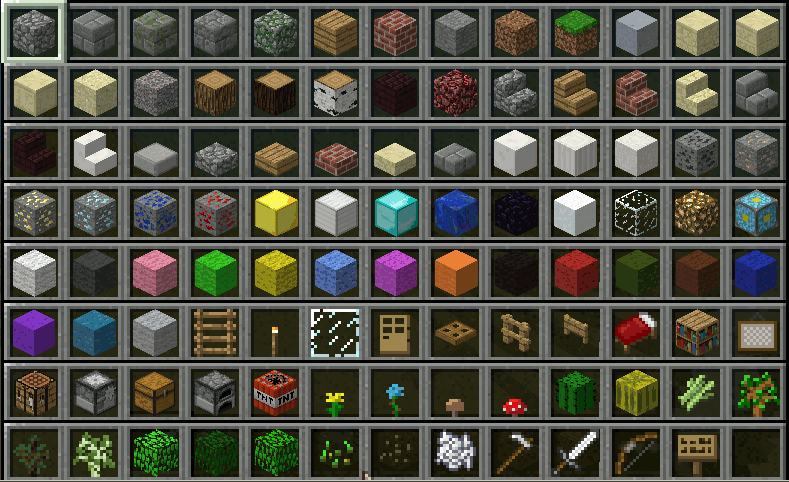 This means we can ask for entities that have or don’t have a certain set of components. document.querySelector('[enemy]:not([alive])'). Declarativeness: Lastly, the DOM provides HTML. A-Frame bridges between ECS and HTML making an already clean pattern declarative, readable, and copy-and-pasteable. // Do something when component first attached. // Do something the component or its entity is detached. // Do something on every scene tick or frame. For building VR applications, we recommend placing all application code within components (and systems). An ideal A-Frame codebase consists purely of modular, encapsulated, and decoupled components. These components can be unit tested in isolation or alongside other components. When an application is created solely with components, all parts of its codebase become reusable! Components can be shared for other developers to use or we can reuse them in our other projects. Or the components can be forked and modified to adapt to other use cases. Components can set other components on the entity, making them a higher-order or higher-level component in abstraction. For example, the cursor component sets and builds on top of the raycaster component. Or the hand-controls component sets and builds on top of the vive-controls component and oculus-touch-controls component which in turn build on top of the tracked-controls component. There are hundreds of components out in the wild. We try our best to make them discoverable. If you develop a component, please submit it through these channels to share! 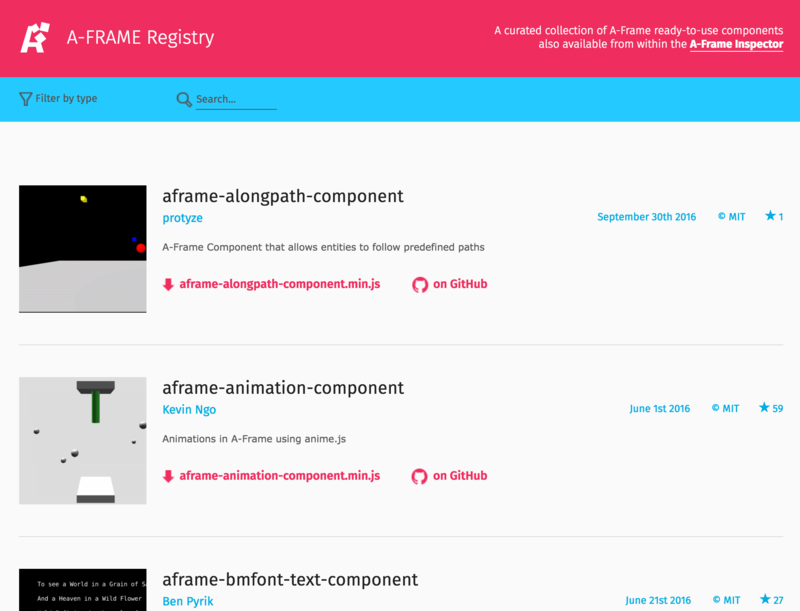 Components are curated and collected into the A-Frame Registry This is similar to the collection of components and modules on the Unity Asset Store, but free and open source. We try to make sure they work well. Once a component is in the Registry, the component can be easily searchable and installable from multiple channels (e.g., angle). Most A-Frame components are published on npm as well as GitHub. We can use npm’s search to search for aframe-components. npm lets us sort by quality, popularity, and maintenance. This is a great place to look for a more complete list of components. Every week on the blog, we round up all the activity in the A-Frame community and ecosystem. This includes featuring components that have been freshly released or updated. The homepage of A-Frame will usually have a link to the most recent A Week of A-Frame entry. Once we find a component that we want to use, we can include the component as a <script> tag and use it from HTML. First, we have to grab a CDN link to the component JS file. The documentation of the component will usually have a CDN link or usage information. But a way to get the most up-to-date CDN link is to use unpkg.com. Rather than typing in the path to the built component JS file, we can exclude path to file to be able to browse the directories of the component package. The JS file will usually be in a folder called dist/ or build/ and end with .min.js. Note the ending slash (/). Find the file we need, right click, and hit Copy Link to Address to copy the CDN link into our clipboard. Then head to our HTML. Under the <head>, after the A-Frame JS <script> tag, and before <a-scene>, we will include our JS file with a <script> tag. Below is a complete example of using various community components from the Registry and using the unpkg CDN. We can remix or check out this example on Glitch.